U.S. stocks are currently trading BELOW their historical valuation average over the past two decades. That's tough for most people to accept... especially 10 years into a raging bull market. Folks around our office even questioned my math when I first began writing about this idea. I understand the skepticism... but the numbers don't lie, as I explained back in October (and many other times here in DailyWealth). We've found a much better value out there right now – one that I view as a "top buy" for 2019. It's trading near its cheapest relative value in nearly a decade. And that could mean we have an opportunity for major outperformance over U.S. stocks in the coming months. The U.S. market has been beaten up in recent months. But if you look outside the U.S., that's been happening for most of 2018. Stocks across the globe fell hard after the peak in January. The U.S. market went on to hit new highs, but few other global stock markets followed suit. One of the worst-hit groups was emerging market stocks. Emerging markets are now near decade-low valuations compared to U.S. stocks. History says this could lead to big outperformance – which would be a major change of pace for emerging markets. Emerging markets are on track to underperform U.S. stocks in 2018. And it would be the fourth year of underperformance in the past six years. The P/E ratio is the most common measure investors use to look at valuation. Right now, the MSCI Emerging Markets Index trades for a P/E ratio of 11.9... while the S&P 500 Index trades for 18.7. Obviously, emerging markets are much cheaper than the U.S. But that's usually the case. 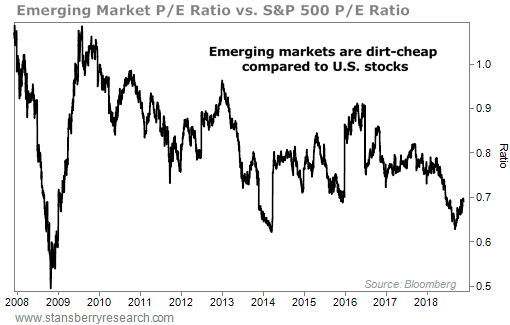 To see this, we can divide the valuation of emerging markets by the valuation of U.S. stocks and chart their relationship over time. A reading of one means the U.S. and emerging markets have the same valuation. A reading of less than one means emerging markets are cheaper than the U.S. This ratio is coming off its lowest level in nearly a decade. Historically, that has been a buying opportunity for emerging markets. Back in early 2014, we saw a similar setup. Emerging markets rallied 23% from early March into September. U.S. stocks rallied 16% over the same period. In 2008, after hitting another valuation extreme, emerging markets soared triple digits over the next year. U.S. stocks rallied 40% in the same period. I remain bullish on U.S. stocks. They're cheaper than almost anyone realizes right now. But history says emerging markets are an even better opportunity for value today. And they are in a fantastic position to outperform the U.S.
Of course, I recommend waiting for an uptrend before putting money to work. When that happens, emerging market stocks will easily be a "top buy" for 2019. "Before I put money to work, I want to find an investment that is cheap, hated, and in the start of an uptrend," Steve says. Right now, he sees a perfect contrarian setup in this beaten-down asset. Learn more here: Three Reasons This Investment Is a Buy Today. "This sector soared during the last 'Melt Up,'" Chris Igou writes. "Today, I believe we are facing a similar opportunity." Read more about another sector that's likely poised for big gains in the months ahead right here.